R I G A G A L L E R Y celebrated 2 0 years of work! This year International Contemporary Art Fair Viennafair focuses on the Central and Eastern European countries. International jury selected 127 galleries from 26 countries to take part in the fair, including the Rīgas Galerija participating with Ieva Iltnere exhibition Obsession. 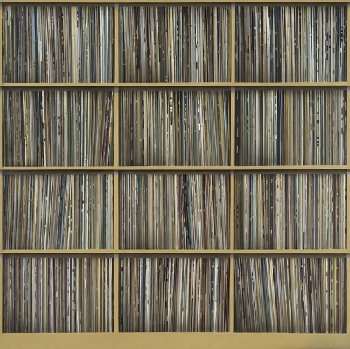 Solo project Obsession includes seven paintings analysing obsession of creating collections and archives, pointing to challenges of conservation with modern digital technologies and quoting an internationally renowned art curator Boris Grois who said that there was probably very much art... A parallel program provides a list of performances supporting the idea. Ieva Iltnere is one of the most outstanding and creative artists of her generation, participating in exhibitions since 1978. 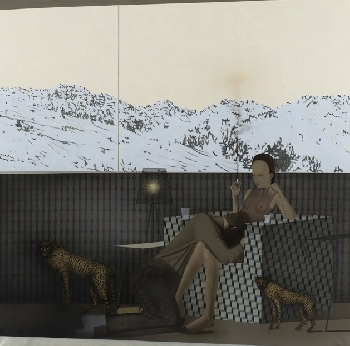 Iltnere has created a particular imagery that clearly marks her individual works. 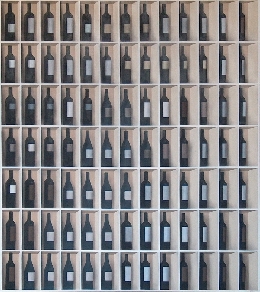 Her paintings feature subdued colouring and discrete intonation, paying particular attention to light and composition. Each work is endowed with a personal touch. Ieva Iltnere will participate at the opening of her exhibition at the Messe Wien, Hall A, Messeplatz 1 in Vienna. This year also 21 internationally recognized curators were attracted to create exhibitions from private collections thus illustrating their vision on private collection development. Romanian curator Lilian Popsecu for Knoll Galerie Wien has selected works of two Latvian painters featured in different private collections Harijs Brants and Ritums Ivanovs. Riga Gallery will participate at international art exhibition BUDAPEST ART FAIR 2010 Heroes Corner Section (Mücsarnok, Dózsa György utca 37, 1146 Budapest) with RITUMS IVANOVS painting "Madonna on stage" which is published on exhibitions web: www.budapestartfair.hu. No fewer than 25 galleries from 12 different countries are taking part in the 2010 Budapest Art Fair – in a special new section devoted to the art of Central & Eastern Europe: HEROES CORNER. HEROES SQUARE has also been adopted as the new name for the Budapest Art Fair – which was founded in 1994 and this year splits into two separate events, with furniture and objets d’art granted their own fair, Antik Enteriőr, at the Ethnography Museum. Meanwhile the rebranded flagship event – Budapest's Modern & Contemporary Art Fair – remains on… HEROES SQUARE. In total some sixty galleries, half from Hungary, will be exhibiting at HEROES SQUARE Budapest Art Fair. The fair runs November 25-28 (VIP opening November 24). The Budapest Art Fair has a track record in attracting prominent foreign galleries. Prestigious past exhibitors include Pascal Lansberg (Paris), Galerie Hilger (Vienna), Le Minotaure (Paris/Tel Aviv), Knoll (Vienna/Budapest/Moscow), and Gilden’s Arts (London) – to name but a few. Now the Fair aims to exploit Budapest’s position as an international crossroads by filling an existing vacuum: the absence of a flagship contemporary fair for Central & Eastern Europe. Inspired by the Tremplin (Springboard) section at the 2010 Paris Biennale, the new HEROES CORNER section will feature 20 of the most dynamic modern and contemporary art galleries in Central and Eastern Europe, plus five Western galleries specializing in East European art. 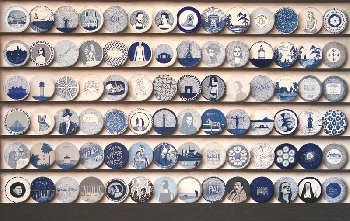 Each gallery will display a single work on a special stand in the centre of the Fair. Gallery owners will be present throughout the Fair to meet visitors and talk about their artists. The twelve countries represented on HEROES CORNER are Bosnia, Bulgaria, Latvia, Poland, Romania, Russia, Slovakia, Slovenia, Ukraine and, from the West, France, Switzerland and the USA. The geographical sweep on HEROES CORNER ranges from Sarajevo (Duplex/10m²) up to Riga (Alma, Tifāna, Rīgas)… and from New York (Art-Fira) across to Ekaterinburg in the Urals (Art-Slovar). The works on offer on HEROES CORNER span a 75-year period, from a 1935 Portrait of a Girl by Pavel Filonov's student Vladimir Luppian (Na Lenivke, Moscow) to a host of 'hot-off-the-press' works produced in 2010, including Sandor Bartha's In The Park (Ivan Gallery, Bucharest); Ritums Ivanovs' Madonna On Stage (Rīgas Galerija, Riga); and Kandinsky & Melamid's Russian Sudoku (Art-Fira, New York). Some paintings are overtly Political, like Tara von Neudorf's Don't Let Your Dreams Fall Asleep, with its Russian flag and USSR logo (Anaid Art, Bucharest), or Yevgeniy Fiks' Portrait of US Community Party member Esther Moroze (Barbarian, Zurich). 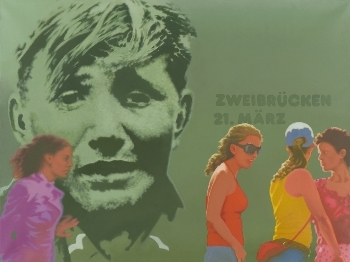 Some are more Philosophical, like Łukasz Jastrubcz's The End (Pies, Poznan) and Valery Chtak's Why Is This Happening? (Paperworks, Moscow). Others are Geographical, like Vladimir Migachov's Black Sea (Russkiy Mir, Paris); or Escapist, like Konstantin Batynkov's tiny Tarzan in a black-and-white jungle (VP-Studio, Moscow). HEROES CORNER will provide a unique, thought-provoking overview of the finest artistic talent to have blossomed since the fall of the Iron Curtain. A strong photography section features six galleries, with startling images like Katya Belkina's naked self-portrait on horseback, inspired by Petrov-Vodkin's Bathing the Red Horse (Fotoloft, Moscow); a harrowing depiction of Vladimir Putin by World Press Photo Award-winner Sergey Maximishin (RussianTeaRoom, Paris); and Boštjan Pucelj's triptych Missing In Action (Fotografija, Ljubljana). Also available on HEROES CORNER will be graphic art, video (Adriana Jebeleanu'sCopy Paste at Little Yellow Studio, Bucharest, Alina Gutkina's My Mom at GMG of Moscow), and a variety of sculpture – from Paolo Vivian's iron Bar Code (Bulart, Varna – Bulgaria) and Małgorzata Warlikowska's six-part ceramic/silkscreen Eat Your Brain Out (Galeria BB, Krakow), to Olaf Brzeski's porcelain plates (Czarna, Warsaw) and Nazar Bilyk's tall glass and fibre-glass figure Rain (Black Square, Kiev/New York). One of Eastern Europe's newest art galleries, Prospekt of Bucharest, will be taking part – and one of the region's oldest, Slovakia's Gandy Gallery, founded (in Prague) 18 years ago. 'Central Europe deserves a great fair!' enthuses gallery owner Nadine Gandy. Ritums Ivanovs. Frame 05. Sold at Sotheby's London sale 2009. The exhibition opened with great success and has had a record number of visitors since its been open to the public. DAVID BIRKIN was announced the winner of this year’s €25,000 prize and was absolutely delighted! The remaining 29 finalist art works will be auctioned, with the proceeds split between the artists and the Barbican Centre Trust, a charity whose recent project activity includes working in neighbouring boroughs in East London to make the arts more accessible to schools, families and communities. Awarded annually, the Sovereign European Art Prize is the only European – wide prize for contemporary art. It offers the chance to purchase works by some of the rising starts of the European contemporary art world. These works are available for bids until this Sunday 20th June. This is a wonderful opportunity to support these artists, put forward by yourselves, and also this charitable project. Leonards Laganovskis (1955), one of most visible and consequential Latvian contemporary art representative, his creative actions started in beginning of 80ies when he brightly introduce himself together with Hardijs Lediņš and Imants Žodžiks in avantgarde group. 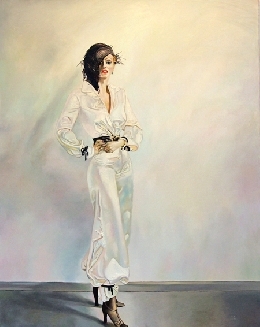 Leonards Laganovskis participated in legendary art exhibition in 1984. „Nature. Environment. Man” at St. Peter’s Church (Riga / Latvia) and in first Latvian art important exhibitions in the west „Riga – Lettische avantgarde” in Berlin 1988. At paintings, prints, photographic and objects which are created at late 80ies mark themes, motives and conceptual developments whose are characterize artist’s creations till nowadays. Criticizing authority mechanisms Leonards Laganovskis with help of framing text or image and overstatement fragments ironical paraphrase authority symbols and languages cliché in what he discover absurdity of that. In the early 90ies Leonards Laganovskis mostly worked at Berlin. Participating in Germany’s art life, organizing solo exhibitions as well as taking part in the international group exhibitions and cooperate which Germanys premier art Galleries and art institutions, artist has taken wide international experience and is grand holder of several grants. After returning in Latvia with new verities and new experience Leonards Laganovskis very bright confirms himself in International 12th Tallinn Print triennial (2001) to getting 1st Prize for his work in which in one page were assemble all texts from Holy Bible. At 2004 L.Laganovskis benefit Latvian Art Union Prize of Year for the best solo exhibition “Right to Desire” hold at Riga Gallery. Play with measures, concept and language is brand and trade mark of Leonards Laganovskis. His eternal theme - technologies of authority which are look through political, social and commercial prism. Works by Leonards Laganovskis represented Latvian contemporary art in important exhibitions like "Bouquet" at RussianStateContemporaryArtCenter (2008, Moscow/ Russia) and international art fairs like ART MOSCOW (2005, 2006, 2009, Moscow/ Russia). At 2009 in major solo exhibition “Normal” at Art Museum Arsenāls (Riga / Latvia) metre of conceptual art confirms his reputation brightly. At solo project in Vienna will be demonstrated selected works from Leonards Laganovskis series Vodka, Lecterns, Fashion and 90ies series Food. Private collections in Latvia, Europe, Russia etc. 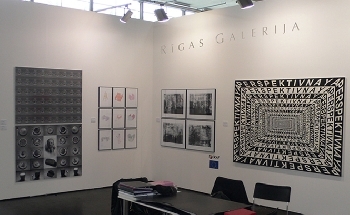 RIGA GALLERY participates in the prestigious International Art Fair ART MOSCOW for the ninth time. For the first time Latvian contemporary artists Līga Purmale’s and Ritums Ivanovs’ works will be offered at the international auction house Sotheby’sexhibition-sale in London, 9 June. The unprecedented idea to show a representative collection of Latvian art to an international audience occurred to Joanna Vickery, Head of Eastern European and Russian Art Department. A year and a half ago, she was surprised by our artists’ excellent achievements at the International Art Fair Art Moscow, and anticipated that this idea might be realised. She commissioned Dr. Alla Rosenfeld, a noted expert of Russian and Baltic non-conformist and conceptual art, Vice President Senior Specialist in Russian Paintings at Sotheby’s New York Department, curator at Norton and Nancy Dodge collection (permanent exposition at Jane Voorhees Zimmerli Art Museum, Rutgers University, New Jersey / USA), author of catalogues and books as well as specialist in Latvian art, to visit Riga Gallery last December. 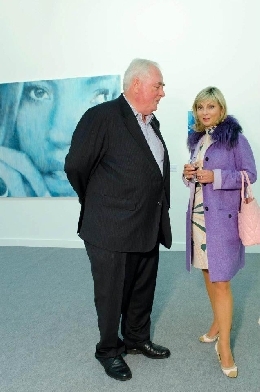 She also agreed that Latvian artists’ works deserve the highest valuation. 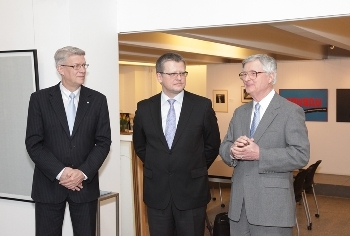 Taking part in Sotheby’s is a serious indication of Latvian art market’s international development. 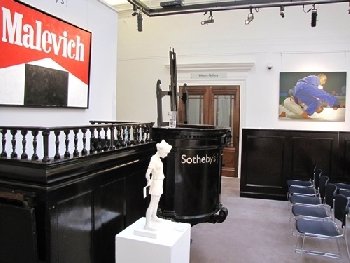 As is well known, Sotheby’s is the main player at the world art market and such celebrated artists as Damien Hirst, Gerhard Richter, Mark Rothko etc. have earned their world fame as a result of these auctions. Sotheby’s auctions are in the focus of attention of world art collectors, businessmen and researchers. 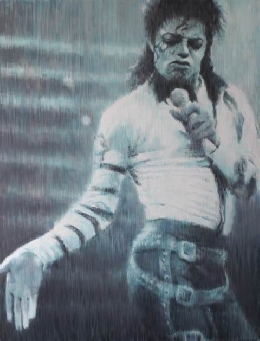 This event is extensively reported in mass media all over the world, and prices set at these sales by professionals and accepted by collectors are equivalent to artistic quality. Sotheby’s auction catalogues are received by international art collectors and researchers. Līga Purmale’s and Ritums Ivanovs’ works from the Riga Gallery collection will be included in the June edition of Sotheby’s London catalogue. 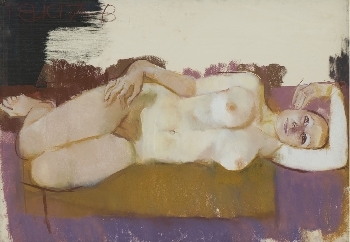 On-line catalogue from 11 May at www.sothebys.com – contemporary Russian on-line catalogue. Reserve prices of these works are 8000 – 12000 GBP. Exhibition on view from 5 to 9 June, 2009.